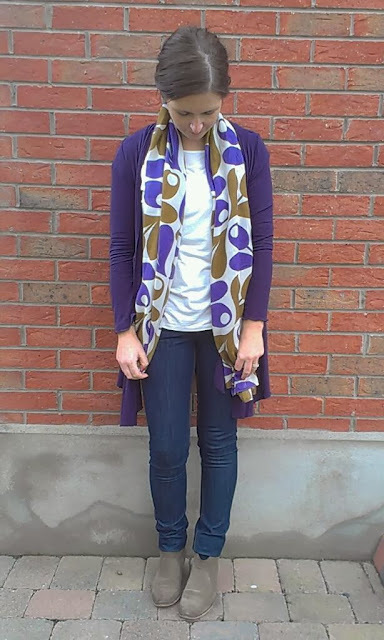 This was supposed to be just an outfit post but it became the Battle of the Supermarket Jeans - sounds quite dramatic! But it's actually quite scary as you're going to see proper 'does my bum look big in this' photos. And no, I don't want the answer to that! Now, onto the jeans...they were bought in the sale in Tesco the other night when I went in to get groceries. I do online grocery delivery for a reason....I am dangerous when let loose in-store. I bought these because they were my size and I liked the denim and they were £7. Three pretty excellent reasons, I think you'll agree. When I brought them home, I noticed that they weren't any old skinny jeans...oh no, they are Lift Sculpt and Slim Skinny jeans. Well imagine that? What a promise for £7!! They're £18 online so I'm now wondering if the price reduction was a mistake? Then I thought, well, I can't really prove they are lifting, sculpting and slimming me unless I do similar photos of my rear in an equivalent pair of jeans. So I raced upstairs and put on my Sainsbury's skinny jeans (which I like a lot and are along similar lines)...BUT which my hubby told me looked awful on my bottom last week. I did ask...he's very honest. I can't really see any difference - my bum is there in both of them...in all its glory. The Tesco ones are higher waisted and do not need constant hoiking up (big plus) but really aren't noticeably better on me. Interestingly, hubby preferred the Sainsbury's ones when shown this photo which further discredits my research. I keep seeing them and I look at the back of them and I don't like the extra darts they have to put in which spoils the classic look of how a pair of jeans should be for me. So far I have resisted on those accounts though the shape and lift factor does hold some appeal. I did see a really detailed jean review not so long ago which dissected the placement of back pockets and stuff and I can never look at a pair of Gap jeans in the same way again. Sigh. Well Avril, its a tough call as they both look great, I think the Sainburys for a good occasions and the Tescos for day wear. I tried a pair of really expensive jeans before I think they were lifted and push thing in all directions. I tried the Primark ones recently and they were pretty good. There's a whole new field of science in this I guess! 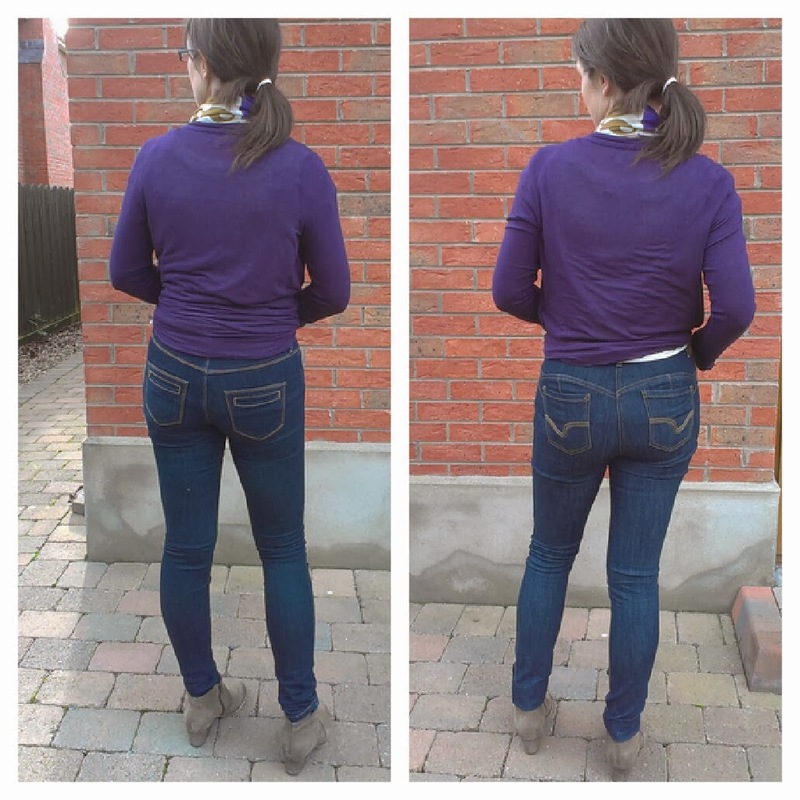 I love the Next Lift, Slim and Shape jeans and have two pairs and a pair of Lift and Shape skinny grey trousers which also have a bit of stretch. But these were £45 a pair. So would be happy if these do the same thing. Prefer the Sainsbury's ones on you but you look great in both! It's a good bit of research and although I don't think there is a huge amount of difference, the Tesco ones are such a bargain, I actually feel like going to my local store to get a pair! I actually prefer the Tesco jeans but I do worry how they can make such great jeans so cheaply. I tried on a pair of 'Magic' jeans at one of our stores and felt like I was in a straight jacket - has made me rather sceptical.